When it comes to purchasing function, one very commonly debated topic is the cost of processing a purchase order. And given the focus on it, you are obviously asking this question – how much does it cost to process a purchase order in my organization? Companies are always looking to reduce the operational cost and if you have a large operation where you are creating thousands of purchase orders in a year, the cost adds up. If you can even reduce even $5 from the cost of a purchase order then it could easily save you the cost of an FTE. Assuming that you have 15,000 PO’s in a year – the total comes to $75,000 in this case, which is an average cost of FTE. The cost of a purchase order includes different aspects, for example, the cost of creating it, approving it, changes etc. If you are able to reduce the cost of processing a purchase order, that also means that you are reducing the complexity of your purchasing process. Many purchasing organizations measure their effectiveness by tracking the KPI of cost per PO, hence it is critical for them to continuously improve on this KPI and reduce the cost. It allows the organization to reallocate the resources to higher value-add activities. All procurement teams are challenged to do more with current resources. Procurement key KPI’s also include savings contributed to the organization’s bottom line. 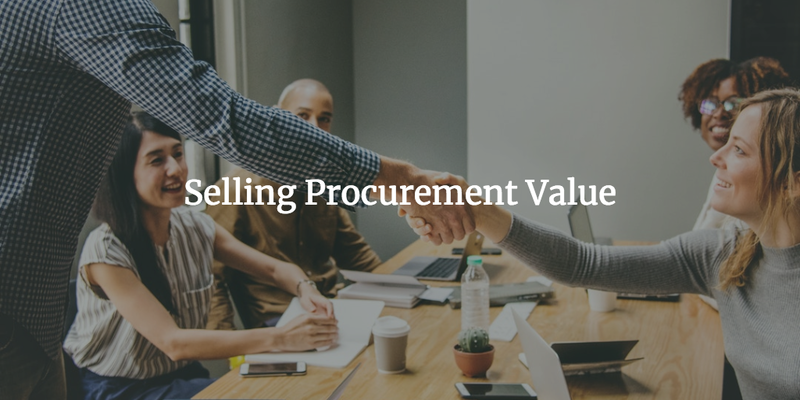 If procurement can allocate more resources to negotiating cost savings vs. processing purchase orders then that is a better result not just for procurement but for the entire organization. 2. Calculating your purchase order cost? 3. Elephant in the room – Is the PO cost savings real? 4. How to reduce the cost to process a purchase order? When it comes to benchmarking the performance of the procurement organization, there are a lot of benchmarks. There are studies conducted by different organizations and based on that you can see that the cost of PO ranges anywhere from $50 to $1000. Next level purchasing have a great blog post on this. There is a real business case for reducing the cost of a purchase order. Let say it cost $500 to process a purchase order and let say you process 10,000 purchase orders a year. If you reduce the cost even by 10% ($50) – there are an annual cost savings of $500,000. The other observation is, there is no way our cost is this high. These benchmarks don’t make sense or do not apply to our industry or company. So which observation is correct? In our view, both are correct. There is no standard benchmark which you can apply to your situation to get the cost of processing a purchase order. On the other hand, there is a business case for reducing the cost of purchase order because this is a real cost and any efficiency you can gain by optimizing your purchasing process can result into hard savings. Now you are saying, you got me confused! Actually no. 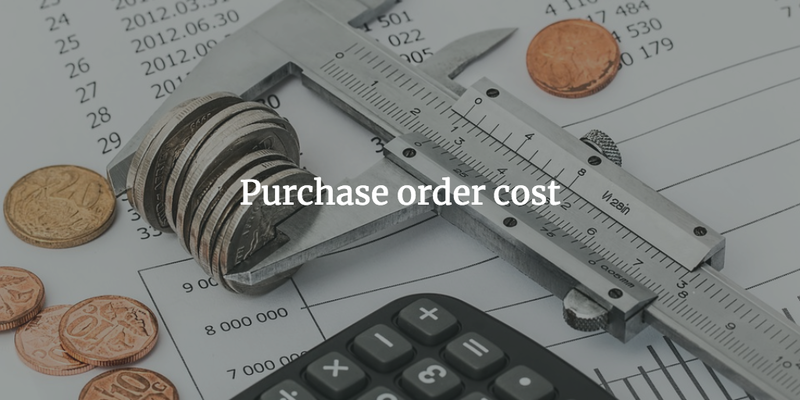 Instead of relying on a standard benchmark, the goal of this blog post is to introduce you to a methodology on how you should think about calculating the cost of a purchase order and let you be the judge of how accurate the calculation is. 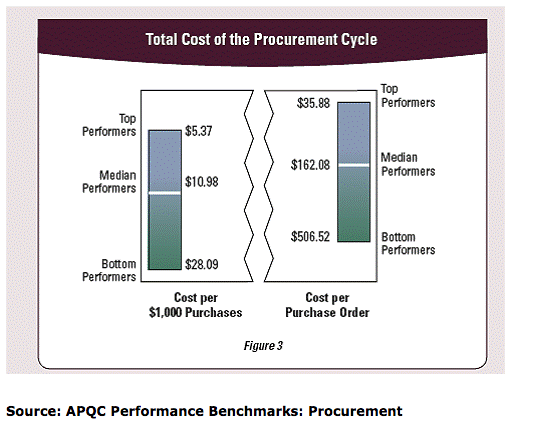 If we can’t rely on benchmarks, how do we go about calculating the cost of a purchase order? 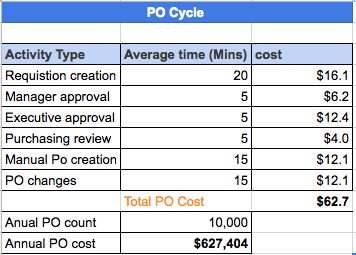 The short answer is getting to your own numbers by looking at the various components of the cost factors in your purchase order cycle. In the steps below, we are going to walk you through a step by step process to calculate the cost of a purchase order. The approach is not perfect, so I’m sure there are some steps missing so please feel free to leave comments and let us know what we missed. The first step is to list down all steps in the purchasing process. If you already have a well-defined process, then that is great. In this, you are documenting how the requisition is created by the user. Whether the process is manual or system based. If system based, do you have catalogs or other ways to reduce the data entry by the user? Here you are documenting the steps which are involved in the approval process. The important step is to note how many requisitions are approved at which level. Are most of the requisitions being approved at a manager level or most of the requisitions go to an executive for approval. The reason measuring this is important is that executives are paid more than the managers, so when you are calculating the cost of this step, it is important to accurately document where the approvals are happening. Based on the type and amount of the requisition, it might go to different people for approval. So if you are able to reduce the number of steps or simplify your purchasing process, you can reduce the overall cost of the process. We will cover this in a later section. For now, just document the average number of steps in the whole process. How you create your purchase orders? 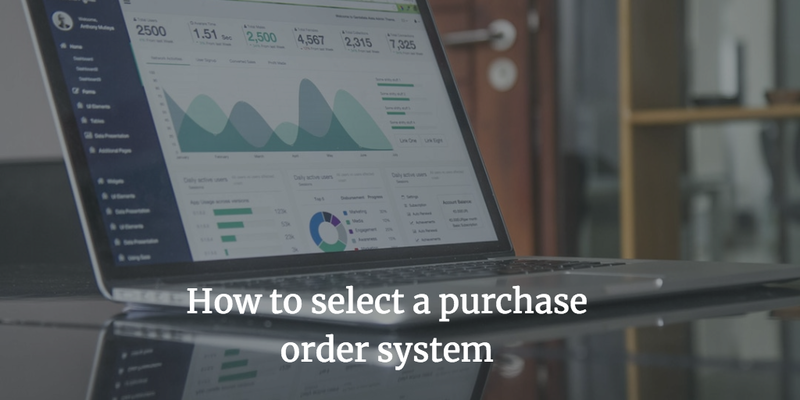 Are the purchase orders created manually or are they created automatically by a system? If the orders are created manually, then how many people are involved in this step. Also, what are the different types of purchase orders you are creating? For example – the time it takes to create a 1 line vs 30 lines purchase order is significantly different. If the process is fully automated, then that is great. 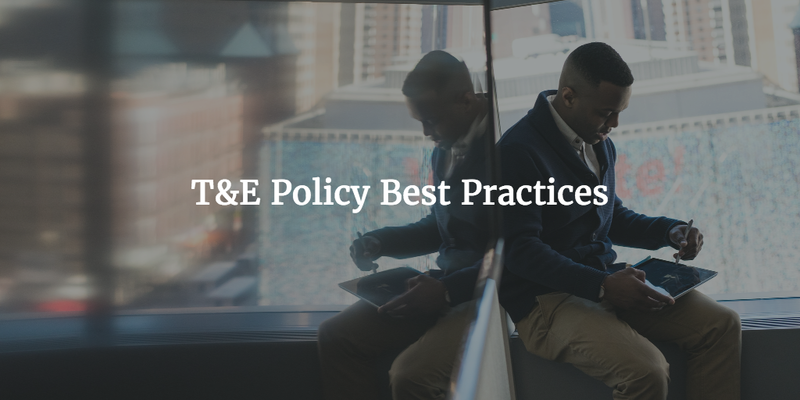 In that case, you are already adopting the best practices. How is the purchase order sent to the supplier, Do you email, fax etc. The manual process of course takes time and if the process is automated then you have reduced at-least one step in your purchasing process. In the next step, we are going to calculate the time it takes for each of these steps. Here you want to calculate average time taken at each step. This step is tricky because you have to take the average of the process. For example, the requisition process. The time it takes to create a requisition for office supplies is significantly less as compared to creating a requisition which includes a bill of material for a new capital equipment. Now I’m not asking you to look at every requisition and calculate the time for each of them. But you can do a high-level break up of the type of requisitions and the average time for each of them. Create different buckets for the different type of requisitions – In this case, it is Low, Medium and High. Estimate the % for each type of requisitions. Estimate the average time for each type of requisition. Calculated the weighted time and add all the three types to get the average time. In this case example, the average time for creating a requisition is 12.5 minutes. Please note that we mentioned that it is an estimated time because you can spend all the time on this to get a perfect measurement. The idea is to do a quick assessment. 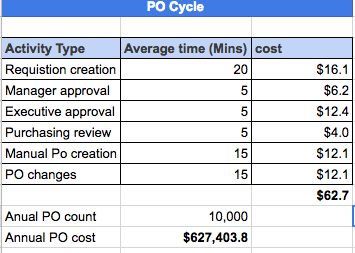 The average time for approvals – Don’t just include the time for approving the order but also calculate the time for chasing executives for approvals. The average time for creating a purchase order. You can either take an average time based on the feedback of your purchasing team or you can create different categories for purchase orders and do a similar assessment as we did for requisitions above. The average time for sending the purchase order to the supplier. Next step is to estimate the cost of an individual role involved in the approval process. I’m not suggesting that you ask people how much they are paid but your finance department should be able to provide you an average number you can plugin in your calculation. Don’t just take the base salary but take the fully loaded cost which includes companies cost for employees. A simple rule of thumb is to add 30% to the employee’s salary. For the procurement organization, you should be able to plug in the exact numbers. Preferably calculate the cost per minute, The reason being is that the average time for requisition approval is in minutes and you want to calculate the cost based on that time. So with all this data, you are now ready to calculate the total cost of a purchase order. The resource type is the different resources involved in your approval process. Note that we are including the type of resource and not resource title since that will take more time. Again this is just an estimate. Per hour cost is calculated by dividing the annual cost by 1820 hours. You can check with your finance department on what they consider annual FTE hours. Per minute cost is of course per hour cost/60. The numbers are rounded off to keep this simple. Add the total cost for each of the steps. Please note that we are assuming that the purchase orders are created manually but if that is not the case, adjust the steps accordingly. You can calculate the annual cost by taking your annual count of purchase orders * Cost of a PO. In this example, we assumed that the annual purchase order count is 10,000 and the calculated annual cost is $627,000. Now even if you able to reduce the cost by 20 – 30% ( Which is not unrealistic ) – that is annual cost savings of $125, 400 to $188,100. Of course, it is up to you decide if this is worth your time and effort. Procurement cost savings can be categorized into hard savings and soft savings, or in other words, cost reduction or cost avoidance. Same is true for the cost of Purchase order. Let’s assume you identified some changes to the purchasing process which would reduce the number of steps required for approving a purchase order. Another example is of automation – you decided to invest in a purchasing system which would automate the process and hence reduce the cost. Now let’s say making these changes require an investment of $X/year. 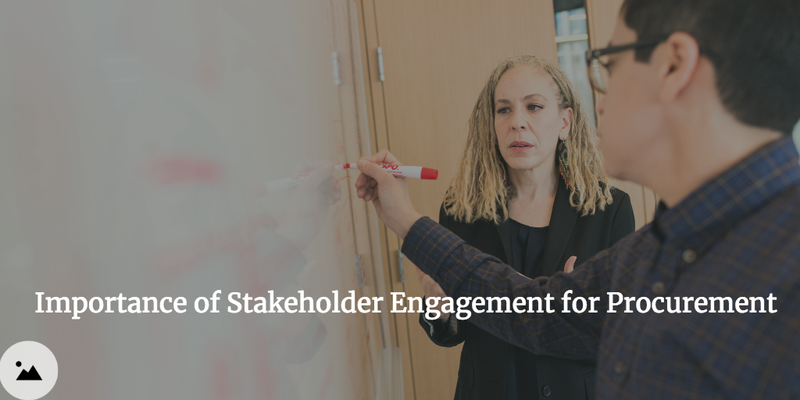 The obvious next step is to build a business case to secure funding and present it to your finance committee or your boss. 99.99% of the time, finance would ask – would this lead to headcount reduction? 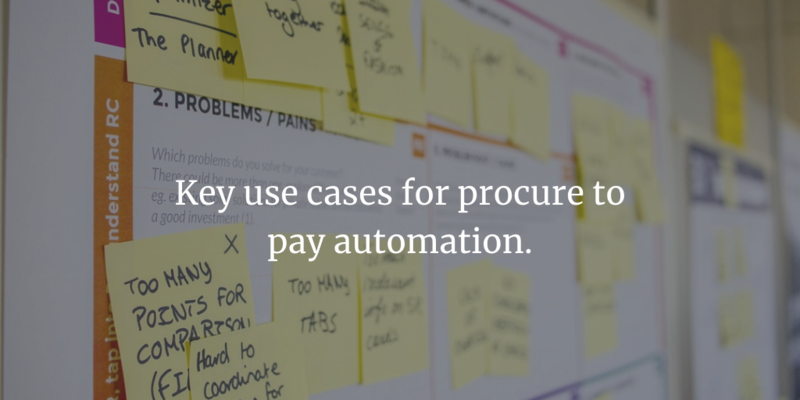 In most of the purchasing automation business cases, it generally doesn’t include headcount reduction as part of the cost saving calculations. 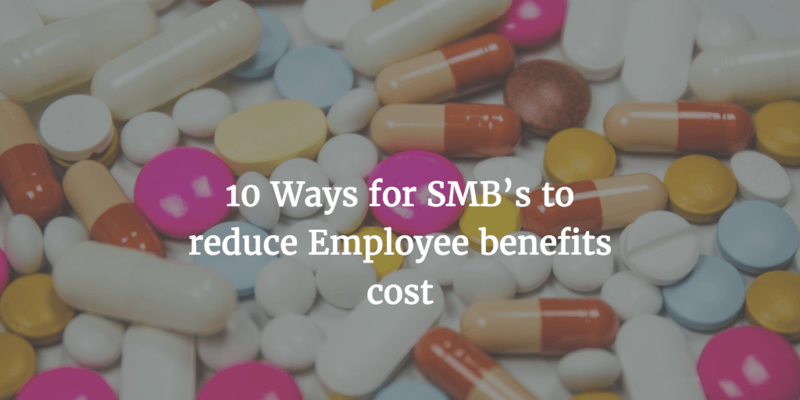 If it does lead to headcount reduction, then the business case is straightforward. However, if that is not the case, here is how you should go about justifying the investment. It will free up your resource time to work on other value-add activities, like increasing spend under management. The resources which are working on checking compliance manually can now rely on the system to do it. The resource time can then be leveraged to build catalogs which can drive automated compliance. Let say your total vendor spend or sourceable spend is $200 M. Sourceable spend means spend which excludes things like payroll, taxes, employee benefits, regulatory payments etc. Since you are able to increase your spend under management because of freeing up your resources, the assumption is those resources are now allocated to high value-add activities. Let’s say you increased spend under management by 3% [arbitrary number, do your analysis to get to this number] which means additional $6M [3% x $200M ] in spend under management. 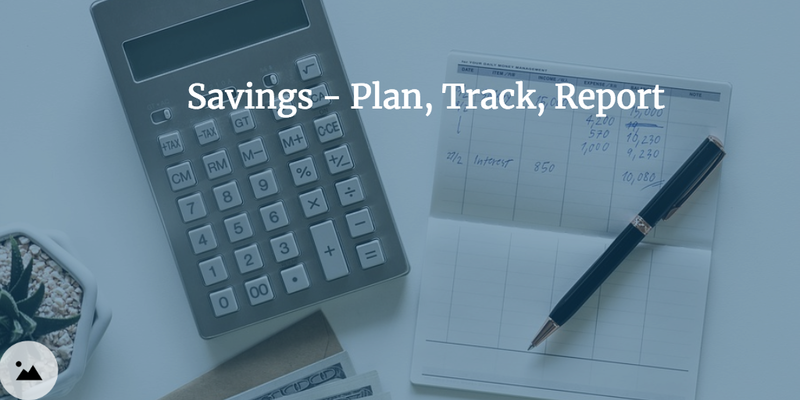 If your average rate of savings is 3% – that means you can now deliver an additional $180,000 [3% x $6 M ] in annual savings because of freeing up resources. So run your numbers and see what hard savings you can deliver by re-allocating resources from tactical work to strategic work. If you are reading this section, then congratulations in believing that the business case for PO cost reduction is real. Now let’s look at options at reducing the cost. So what are the cost elements? Gathering information to create a requisition. Entering data into the system, whether that is creating a requisition or entering a purchase order in the system. Review of requisition or order for data accuracy. Review of requisition or order by the manager for approval. 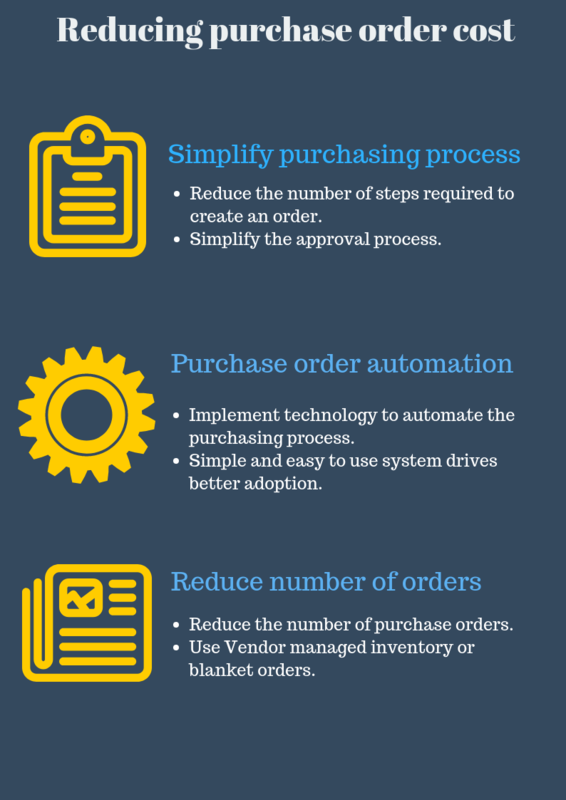 Before you look into automation of the purchase order process, look at your current purchasing process. By simplifying your purchasing process you can significantly reduce the cost of the entire purchase order process. 1. Steps in the purchasing process. In this step, you are looking at your complete purchasing process and identifying steps which are either redundant or time consuming for the end users. 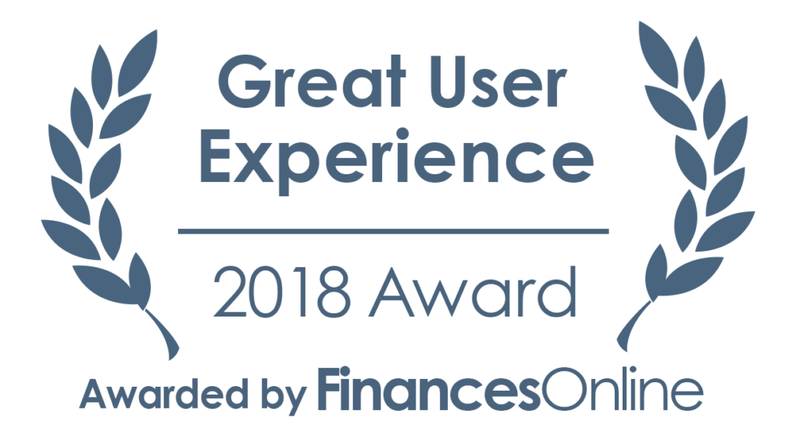 Here end-users are company employees who are putting in the requisitions because that is the source of frustration and time in the entire purchasing process. How many steps you have in the approval process. Is your approval process optimized? Let’s take an example – let’s say you have a rule that everything above $1,000 needs to be approved by an executive director of the company. So let’s do an analysis of how many requisitions are above that threshold. Let’s say the result is that 5% or 10 % is above that threshold. Then that rule might make sense because the idea is to have high ticket expenses to be reviewed by senior management. Contrary to that, let say 50% of requisitions are above the $1,000 threshold – then it might be time to review the approval process and decide whether you still need to send all such requisitions to the executive director. You might need to increase the threshold. This will not only allow you to use the executive’s time effectively but also reduce the time it takes to approve requisitions. Are there any additional review processes which can be eliminated? For example in some companies, the requisitions for inventory items need to be reviewed by the inventory manager. The review is generally in place to ensure that you don’t order items which are already in inventory or optimal inventory levels are maintained. Instead of keeping the review during the creation of the requisitions or orders, maybe it is helpful to have this review done before the requisition/order is put in the system. The alternative would be to shift the responsibility of order creation to a person in the inventory department so that they only place orders after verifying the inventory levels. You should review each and every step in the purchasing process and question whether that step is adding value anymore. You might find that a certain step was put in place 10 years back for a reason which is not valid anymore. Ok, I am stating the obvious here. ProcureDesk is a purchasing automation platform, so of course, we talk about automation! 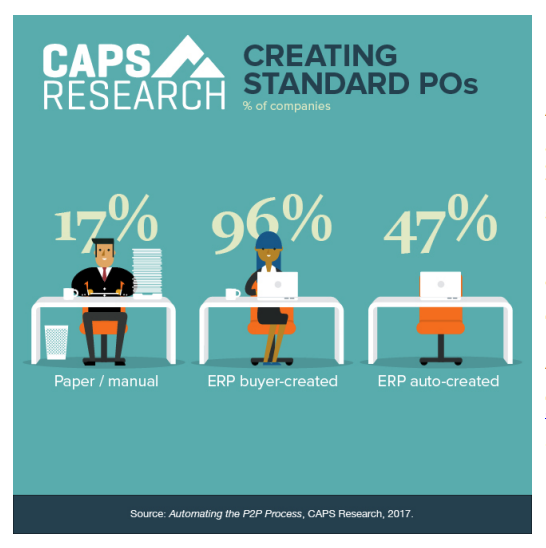 On a serious note, smaller to mid-market companies can realize the value of automation but struggle with the business case for automation of the purchase order systems. Hopefully, this analysis on the cost of a purchase order can help you strengthen that business case. Building more catalogs – you can look at repetitive spend and add those items to a catalog. That way, users can create requisition with fewer clicks and without the need of entering the data manually in the system. The data for past orders are readily available, so it is easy to reference old orders while creating a new order. If you have a manual approval process, your users are spending the time to figure out the right approval hierarchy. In some cases, the approving managers might be routing the approvals to the right manager. It is also possible that a lot of purchase authorization requests are routed back and forth because it was routed to a wrong manager. All this can be avoided by leveraging automation of the purchasing process. The system can easily identify the approval hierarchy based on parameters like spend, department, purchase category etc. The other benefit is the reduced approval time. If the purchasing system has a mobile app, then that can be used to approve requisitions. Since most of the executives are on road or busy in meetings, this can be a handy feature to reduce the time for approvals. This step can be fully automated by leveraging a purchasing automation tool. 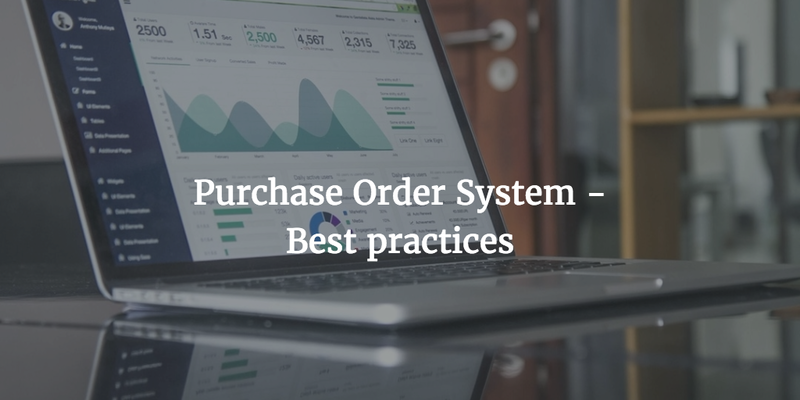 Instead of buyers creating purchase orders manually in your system, the purchasing system can do this for you. Also, most purchasing systems integrate with your accounting/ERP system, so the same PO data is also available in your ERP system. It also saves you time on sending the PO to the supplier because that step can be fully automated based on the preference of your suppliers. The obvious case where it doesn’t work is that if your supplier still demands a paper purchase order. One obvious step in reducing the cost of a purchase order is to have a limited number of purchase orders. Fewer PO’s leads to a lower processing cost. Can the purchase be consolidated across departments or across different people within the departments? They might order more often – order when you need it. Multiple people might order similar items at a different frequency. This though is convenient but if you were issuing purchase orders to vendors, then the cost could easily add up. Instead of that, you can consolidate the purchase by having one department per person ordering those items. To further reduce the frequency of orders, you can order monthly. This is a very simple example and might not be a consideration for you if you are a small company. Items for which you want to maintain inventory, you might want to consider a vendor managed inventory option. If you purchasing recurring services – for example cleaning services then instead of creating a purchase order every month, you can create a blanket order with the annual amount. The vendor can invoice against that order till the amount is consumed. Though it reduces the number of purchase orders, it does need an additional layer of diligence and compliance. You want to make sure that invoices are properly vetted before they are paid, otherwise, the vendor could charge extra and still get paid if the invoice amount is lower than the amount on the blanket order. When it comes to calculating the cost of a purchase order, there are a lot of benchmarks available. Some might apply to you and some don’t. The best approach is to calculate your own cost based on the approach we defined in this post. We agree that it takes some time but it is more reliable than using any standard benchmark. 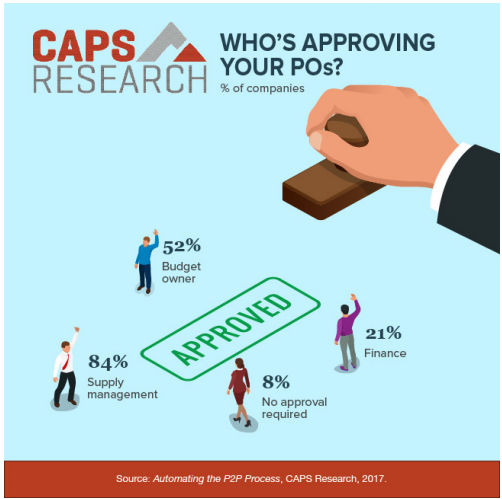 Moreover, when it comes the time to invest in technology for purchasing automation, you can use these numbers to build the business case for investment and no one will question your assumptions about cost per purchase order. This is by no means a very comprehensive approach, so feel free to leave your feedback and we can work on improving this. Procuredesk can help you reduce the cost of processing purchasing orders. See for yourself, register for a free demo.